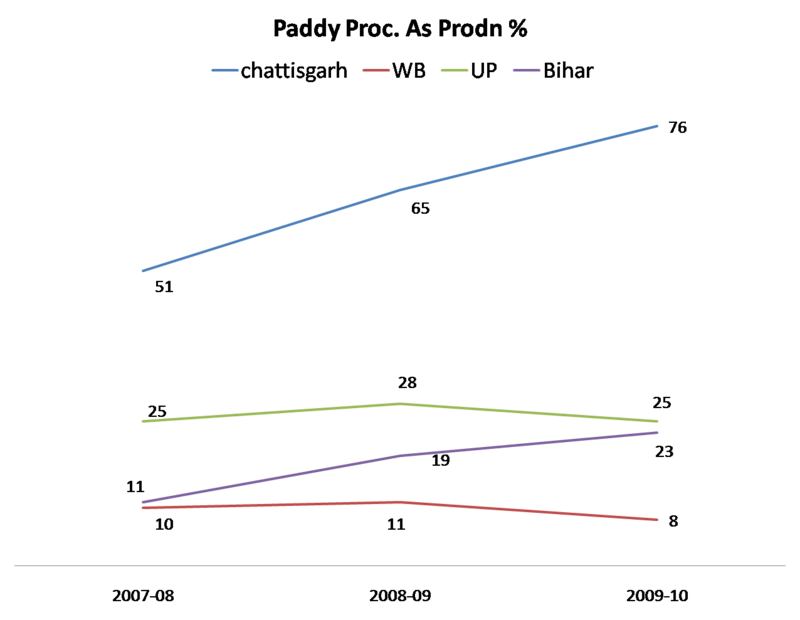 Ensuring Food security has been a concern for most of the emerging countries. Enactment of a Right based Food Security Act has been one of the promises of the present regime in India. An exercise has been taken up since 2009 in this direction. A number of concerns however have been raised from time to time, especially in the media and various public forums, questioning the ability of the Governmen to ensure the availability of required food grains which has direct bearing on the proposed coverage, pricing of the food grains and method of distribution and in the process, a scenario is being created which casts serious doubt on the ability of the Government to meet the requirement of food grains if a right-based law is enacted on food security. The necessary and sufficient components for ensuring Food Security are (i) Food grains availability; (ii) budget to support the subsidized distribution; (iii) accessability by the target group. Serious concerns have been raised in recent times regarding the availability of Food grains and procurement of food grains as the limiting factor in ensuring food security in India. I will try , based on the actual production and procurement scenario, to unravel the mystery. 4. Public Distribution System (PDS) reforms. NAC recommends that subsidized food grains should be made available to at least 75% of the population – comprising of 90% in rural areas and 50% in urban areas. It suggests classifying households in two categories – i) Priority households (which is Below poverty line (BPL) including Antodaya Anna Yojana (AAY) in the present classification) – NAC suggests that 46% of the rural population and 28% in the Urban areas are Priority Households and they should be entitled to have a monthly entitlement of 35 Kgs (or @7 kg/person) at a subsidized rate of Rs 1/Kg for millets, Rs 2/Kg for wheat and Rs 3 /kg for rice; ii) General Households (population including Above Poverty Line (APL) as classified presently)- which is 44% in rural areas and 22 % in urban areas. They are to be entitled for 20 Kg/ month (or 4 Kg per person) at a price not exceeding 50% of the current MSP for millets, wheat and rice. Together, it implies coverage a 90% rural population and 50% urban population. NAC also suggests that in the first phase, coverage should be 85% rural population (46% Priority population and 39% General Population in Rural areas) and 40% of the Urban population (28% priority and 12% General Population in Urban Areas) and that, full coverage should be extended by March 2014. 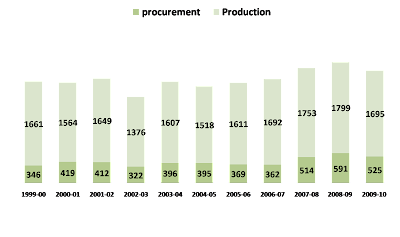 Population is taken as on October2010 and Food grains requirements is shown in Million Tones. The buffer norms (including strategic reserves) including provisions for natural calamities requirements of about 5 million tones (3.5 million tones plus 1.5 million tones for natural calamities) and provision for ‘Other Welfare Schemes’(OWS) @ 6 million tones imply an additional requirement of 11 million tones. This implies a procurement requirement of 69.07 million tones during Phase I and about 75 million tones from March 2014 onwards. The present levels of procurement range from 54-60 million tones and this poses a serious challenge whether procurement sets the limit to which Food Security requirements are determined. I am not going into the details of subsidy requirements as it is presumed that the necessary subsidy budget shall be provided as it is a mandate of the Government. The issue of identification of the poor and ensuring proper distributon to the needy also poses a serious challenge and i shall delve upon it in a different note. I will go into the issue of procurement and how it can be increased and what can be the upper limit of procurement and issues involved there in. 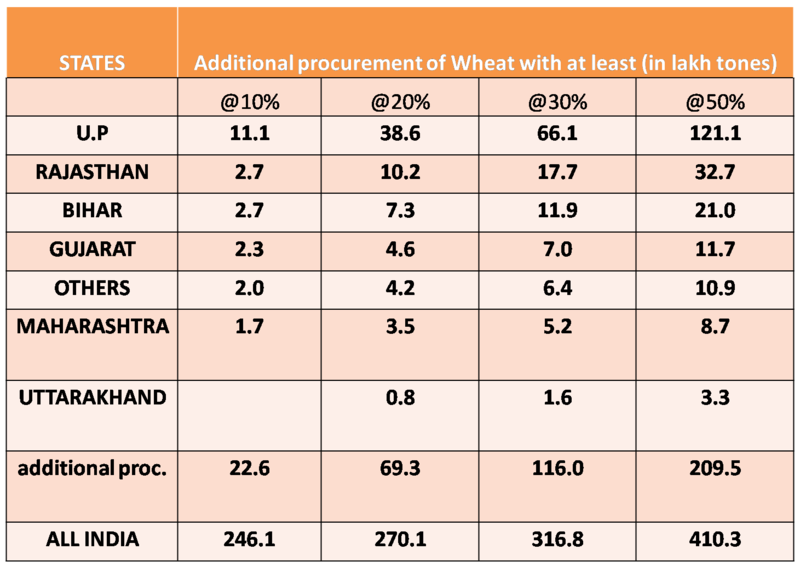 Is Procurement of Food grains a constraint and what’s the upper limit? The combined production of wheat and rice has been more than 170 million tones since 2007. 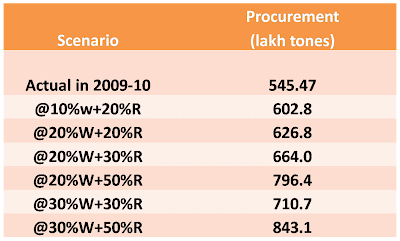 Procurement, which was less than 40 million tones till 2006 has been of a consistent higher order since then and is in range of 52-55 million tones. In percentage terms, procurement now is about 30% and above of production and has been increasing. This is mainly on account of highly attractive Minimum Support Price (MSP) and announcement of additional bonus on MSP by certain State Governments such as MP. Farmers thus find it attractive to sell to Government agencies at MSP. 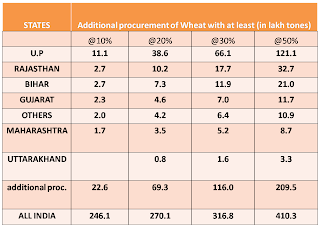 In case of wheat, the all India average of procurement as percentage of production is around 27.8%. It is however an impressive 65.7%, 58.8% & 49% in case of Punjab, Haryana and MP (graph) whereas is abysmally low at 5.9%, 7.5% and 3.7% in UP, Rajasthan and Bihar. 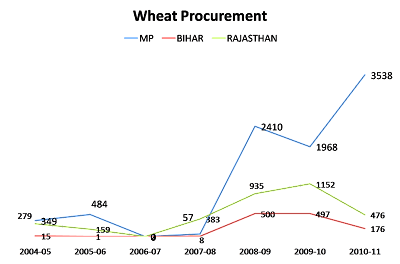 We should keep in mind that UP alone accounts for 35% of the total wheat production and these three low procuring States account for 49.1% of the total wheat production. 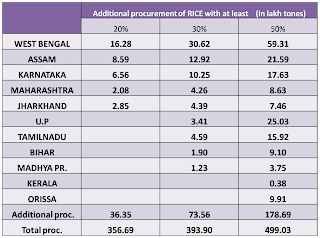 Similarly, for rice, the all India average procurement was 34% of the production. While it was 83%, 76%, 58% and 50% in case of Punjab, Chattisgarh, AP & Haryana, it was a low 8%, 25 % and 23% in case of West Bengal, UP & Bihar. These three States account for 34% of the overall rice production. An often cited reason for low procurement is the quantity of food grains kept by the farmers for ‘self-consumption’. Taking into consideration the landholdings of small & marginal farmers and agriculture labourers, the overall quantity kept for self-consumption will be around 20%. This, thus still leaves a huge gap of produce which doesn’t get procured especially in these low procuring States which otherwise have high levels of overall production. Another interesting reason which is certainly not co-incidental is the fact that States which have high levels of procurement have high levels of taxes on agriculture produce. For instance the level of taxes in Punjab, Haryana and AP for rice is 13.5%, 10.5% & 12.5%. It is no coincidence that procurement of rice in Orissa has gone up and so have the tax rates which are now 8.5%. The level of taxes in MP on wheat is 8.2(However, UP is an exception in terms of high tax rate (8.5% on wheat) and low levels of procurement). As a result, traders and other operators in private market have little incentive to buy from these States and instead prefer States which have nil or very low levels of taxes on agriculture produce. What happens as a corollary is that the State procuring machinery gets highly active in States with high taxes and it is thus no surprise that procurement as percentage of production is higher in these States. While traders shy away, State fills the void and realizes sizeable revenue in terms of agriculture taxes in the process. While I am not advocating higher taxes on agriculture, the fact remains that it’s interplay in the open market operations does affect the procurement. A positive feature however is that farmers are able to realize the MSP due to the procurement by Government agencies. Let’s look at it the other way round. Traders and private operators are major players in the States which have lower taxes such as UP & Bihar. The official procurement machinery, conveniently thus is completely slackened (there were only 4 procurement centers of the State Government in the wheat producing Bhabua Kaimur District of Bihar for instance) and the procurement is negligible. Not only the State Government loses out on crucial revenue mobilization but more importantly, the farmers are deprived of the MSP as traders/private operators exploit the absence of official procurement machinery and offer rates which are lower than MSP. And it’s these traders/private operators who ultimately benefit from the absence of Government procurement at the cost of Government revenue, farmers and final consumer. Let’s examine the success story of MP & Chattisgarh so far as achieving higher levels of procurement is concerned . 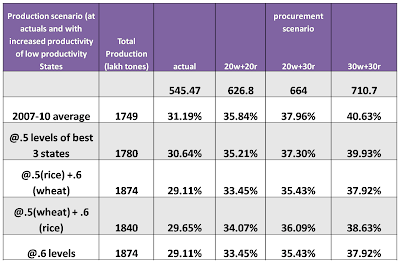 While MP could increase the procurement from a low of 0.4 million tones in 2007-08 to about 3.5 million tones in 2010-11 and similarly, Chattisgarh could increase its procurement from 51% to 76% of production from 2007-08 to 2009-10. And it’s not just about increasing the taxes on agriculture. Both MP & Chattisgarh have systematically been able to reach out to their farmers by opening adequate number of procurement centers which not only ensures that the benefit of MSP r eaches the farmers & that they are not forced to resort to distress sale of their produce to the middlemen/traders/private operators but also ensures higher levels of procurement. These States have also been able to maintain a database of all their procurement farmer wise which is updated on a daily basis and this has been the mantra of sustaining higher levels of procurement. There is no reason why Bihar & UP can’t make similar interventions and achieve higher levels of procurement and save their farmers from being exploited by middlemen/traders by making them realize the benefits of MSP. All it requires is a sustained micro level intervention by State agencies in enlarging and reaching out to the farmers by opening as many number of procurement centers are required and maintaining a proper date base of farmer wise details of procurement done and payments made. The present level of procurement of rice @320.34 lakh tones can be increased to a level of 356.69 if all the rice producing States procure at least 20% of their production. Likewise, the procurement can increase to a level of 393.9 lakh tones & to a level of 499.03 lakh tones if all rice producing States procure at least 30% & 50% of their production. The States requiring immediate effort are West Bengal, Karnataka, Jharkhand, UP, Tamilnadu and Bihar. While the percentage of production kept for self consumption may be higher (when compared to other States) in West Bengal in view of its smaller size of average land holdings, it still doesn’t explain the present levels of negligible procurement. 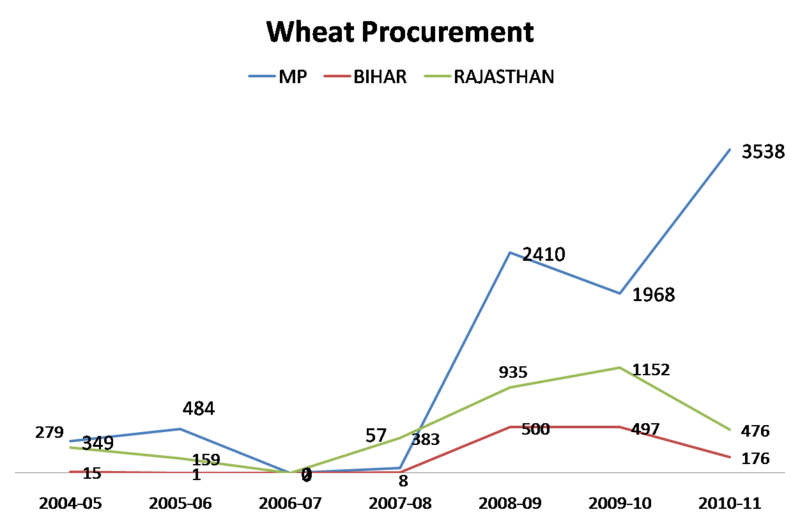 Similarly, if we look at wheat procurement during the crop year 2009-10 (ie. Rabi Marketing Season (RMS) 2010-11), the all-India procurement was 225.14 ( 27.9% of the total production). This could be increased to 246.1 lakh tones (30.46% of production) and 270.1 lakh tones (33.42% of production) if all the wheat producing States make efforts and procure at least 10% or 20% of the their production. Procurement can further be increased to 316.8 lakh tones (39.21% of production) and 410.3 lakh tones (50.7% of production) if States can procure at least 30% and 50% of their produce. Uttar Pradesh is one State which needs to concentrate on wheat procurement and whose improved procurement can ensure an overall comfortable procurement levels in wheat. Is it a mere coincidence that most of the complaints of distress selling by farmers come from the States of UP & Bihar! Accordingly, the total likely procurement during the year can be any of these combinations, depending upon the increase in procurement: The level of about 70 million tones thus can be achieved in a span of three years in an incremental and staggered manner. As such the procurement can be consistently at a level of 70 million tones from 2013-14 onwards. Even after achieving at least 30-40% levels of procurement, there will be enough for the farmers to meet their requirement of ‘self-consumption’. 1. 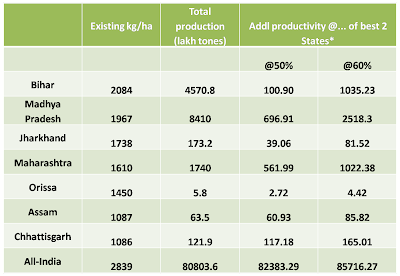 Storage capacity and constraint – storage requirement & capacity for any State is determined in terms of (i) peak production during the last three years for surplus States and (ii) 4 months of requirement under TPDS in food grains deficit States. The overall storage requirement in the country at the present levels is about 60 Million tones. The present capacity in the country is about 42 million tones which include about 27 million tones in covered and about 15 million tones under CAP (Cover and Plinth). While the procurement has been continuously increasing since 2007-08 onwards, there hasn’t been a concomitant increase in the storage capacity. Result has been severe pressure on the existing storage space and to offload the existing stocks in order to create additional space to store the ensuing crop every season. Storage thus present a serious constraint on any effort to increase procurement on a continuous basis and it has to be addressed as an immediate priority if increased procurement has to become a reality. There have been two line of thoughts – while one advocates creating large storage points /silos each with a capacity of at least 0.5 million tones, the other school of thought suggests creation of smaller decentralized locally managed storage points at a District/inter District level with a capacity ranging from 5,000-100,000 tones which will be used both as a procurement point and also, to meet the requirement under Food Security locally. It is possible to create additional required storage capacity within a span of 2-3 years. 2. 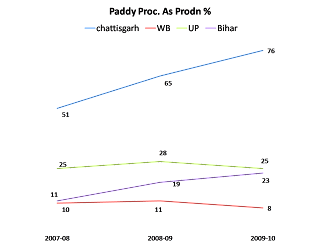 With drawl from the private market and likelihood of food inflation- the total production remains the same and an increased level of procurement implies a likely withdrawal from the private market and any such significant withdrawal may imply perceived shortage of food grains and thus food inflation. This reason is often quoted against any attempt to increase procurement. Let’s look at it closely. States with low levels of procurement are UP, Bihar & Rajasthan. It’s not as if the farmers are able to realize a price better than MSP or that consumers are able to get the food grains at a relatively cheaper rates because more is being made available in the private market (because of lower procurement). While the farmer sells often at a price lower than MSP and final price remains the same, it’s the private trader/middlemen who benefits in the process. As such, I feel the perceived notion of food grains inflation on account of higher levels of procurement in these low procuring States are exaggerated. Another corollary is the fact that farmers, not being able to realize the MSP (& often selling at a rate much lower than MSP) in these States are not able to invest in capital improvements of the land aimed at increasing productivity and are caught in low-productivity, low produce, low price realization trap. Even though it’s not my mandate, let’s have a look at the productivity levels in different States. The All India average productivity (kg/ha), in the case of rice, is 2008 and ranges from a high of 4010 in Punjab to about 872 in MP & 1167 in Bihar. Based on a theoretical simulation, an additional production of about 6.4 million tones of rice is possible if the productivity in low productivity States could be raised to at least 50% productivity levels of the three highest productivity States. Likewise, an addition of 12.42 million tones is possible if this productivity is raised to at least 60% of the average productivity of three best States. 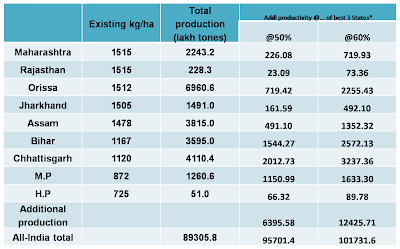 An additional production of 1.6 and 4.9 million tones is thus possible and this does not includes States with very low overall wheat production (Karnataka & AP) or with difficult terrain (J&K and HP). Now, if we combine the effect of increased procurement (with procuring States procuring at least 20 % & 30% wheat and 20 & 30% rice) and improved productivity (wherein the low productivity States are able to realize at least 50% of the average productivity of the States with highest productivity), a procurement of 71.07 million tones amounts to 40.33 % of the overall production at the present levels of production (average production of 2007-10) and becomes around 38% if productivity improves. The present average procurement is around 31% and an increased percentage of procurement does not imply with drawl from the private market or need not be at the cost of quantity earmarked from ‘self-consumption’. The increased procurement will be on account of removing the inefficiencies in procurement and which will also imply realization of MSP by the farmers. It is in fact a win-win situation. Your article is very insightful and you have made some very good points in it. Could you please tell me where you got the accumulated tax rates of rice and wheat from? As far as I know the VAT in Punjab on wheat and rice is aroudn 4%. I am looking at rice, wheat, edible oils and pulses for my research work but have been unable to arrive at an aggregate tax rate that the consumers end up paying for these taxes. Would it include central excise (which is 0 for rice and wheat ), entry tax ( where would one get information for this? ) and state cesses and surcharges ( same question ) along with the State VAT? I would be obliged if you could reply to my query as soon as possible.